I was so excited to be asked to publish a pattern as part of the National Crochet Month blog tour (facebook link) – if you’d like to see more then please check it out, it’s running for the whole month of March, organised by the lovely folks over at Crochetville. Well I had some left over yarn so this pattern was inevitably going to follow on from my Arrow Tails Shawl! I loved my first time making fringing so I had to add some to these too. They are actually more practical to wear than I expected (and stroking the soft fringe is pretty good for stress relief). The pattern repeat is a scaled down version of the one used in the shawl, so that you get a decent number of arrow tails on the gloves. Example shown is heavy dk/light Aran weight yarn. You can substitute any yarn weight, but make sure you go up around 2 hook sizes to usual. This is because the raised stitches combined with single crochet make the fabric very dense, and this way the fabric will still turn out to have some stretch. I recommend using a soft yarn also to add stretch – e.g. merino or alpaca. Avoid cotton unless it is a soft blend! You will be changing colours every 3 rows, so make sure you crochet over your ends to avoid having to weave them in! You can adjust the pattern to your own hand or arm size as you go. Firstly you can alter the size of your starting rectangle by crocheting more or less chains for the foundation, and working as many rows as you want for length. Secondly, as the border adds shaping by combining different stitch heights, you can choose where to put these for a perfect fit – and work a row more or a row less of the border if you like. Yarn over hook twice. Insert hook in the unworked loop 3 rows below, draw up a loop (4 loops on hook). *Yarn over, draw through 2 loops, repeat from * 2 more times so that one loop remains on the hook. The stitch works a like a post stitch in that it counts as having been worked in the next stitch, so leave that unworked and continue in pattern. Begin with your first colour for the Arrow tails section. Example shown uses red. Foundation chain and Row 1: Fsc 27 (or your desired length – it should be a little smaller than the required circumference of your wrist). You can ch 28 and work one sc in each chain (27 sts) if you prefer. Change to 2nd colour – green in example. Change to next colour – purple in example. Repeat rows 4 and 5 and then row 4. Watch out for f.o.w.tr sts worked at the very beginning and very ends of the rows and make sure you include them (only ever work up to 5sc in a row). Change to next colour – cream in example. Repeat rows 5, 4 and 5. Change to next colour – grey in example. Repeat rows 4, 5 and 4. Change to next colour – red in example. Repeat rows 5, 4 and 5. Continue in pattern for further repeats if you want longer gloves. Otherwise, proceed as follows to add the thumb hole. Mark off the central 6 sts. If you have an odd number like me then just mark them one stitch to one side of the centre (you can work your second glove one stitch the other way for a symmetrical pair if you like). Row 6: Change to your next colour (green in example) and work in pattern (row 4) as before until the marked st. Ch6, sk 6 sts, and continue in pattern to the end of the row. You will see that you have missed one of you f.o.w.tr sts. Don’t worry, when you work the thumbhole you will add that stitch in so that the pattern is not disrupted (see photos). Work the next 2 rows (row 5 and row 4) in pattern as before, but when you get to the section above the thumbhole, work an sc where the f.o.w.tr would have been. The reason for this is that you don’t want the bulk of the stitch between your thumb and hand, and also you don’t want to crochet over the hole! Change to next colour – purple in example. Repeat rows 5, 4 and 5. You will be making one of the f.o.w. tr into the chain of the thumbhole in the first of these rows to begin the pattern in this section again. Change to next colour – cream in example. Repeat rows 4, 5 and 4. Final Row*: sc in b.l.o of first st before starting the repeat pattern. *sc through both loops, 3sc in b.l.o., f.o.w.tr in unworked loop 3 rows below, f.o.w.dc in unworked loop 3 rows below, repeat from * to end finishing wherever in the repeat you run out of sts (27 sts). Fasten off. *You may need to adjust the position of the start of the pattern repeat if you have worked more rows than written in the pattern. The easiest way is to find the stitch where you would expect to work the first f.o.w.tr, then work however much of the repeat fits before that st so that your f.o.w.tr lines up in the correct place (one st in each st). How to make the thumbhole – The part of the arrow tails pattern which is missed when making the opening is added when crocheting the thumbhole itself so the overall pattern is maintained. Join green into the back loop of the first st so that you can work across the front in b.l.o. You will work the thumbhole in the round across the front and then turn and work along the chains back to the starting point to join. TH-R1: Work 1sc in b.l.o until you get to the place where you have missed a f.o.w. st in the pattern. Work a f.o.w.tr, then sc in each st and chain around (12sts). join with a sl-st and ch1 to continue to work in the round in the same direction. TH-R2: You will have 6 sts at the front and 6 sts at the back. Work the 6 sts at the front in pattern (depending on how long you have worked your gloves you may find that your f.o.w. st is worked as the first st followed by 5sc, or that you have a number of sc before the f.o.w. st and then more sc such that you have worked 6 sts total keeping in pattern). TH-R3: Work the 6 sts at the front in pattern (depending on how long you have worked your gloves you may find that your f.o.w. st is worked as the first st followed by 5sc, or that you have a number of sc before the f.o.w. st and then more sc such that you have worked 6 sts total keeping in pattern). Tip: If you have larger or smaller thumbs, adjust the decreases made in TH-R2 and TH-R3 to suit. TH-R4&5: Change to Border colour (cream in example). Work in b.l.o., sc in each st around, join with a sl-st and ch1 (TH-R4 only – omit ch1 and fasten off for TH-R5). The shaping is added down the sides of the glove as you work the border. You can adjust the shaping to suit your hand – just lie your hand on your rectangle, lining your thumb up with the thumbhole as shown, to see where you need to add extra width. Join the border colour into the first st of the final row to work anti-clockwise around the rectangle, starting along the final row. Hdc (in grey row), 6hdc (in cream and purple rows), 6dc (in green and red rows), 3hdc (in grey rows), 9sc (in cream, purple and green rows), 3hdc (in red rows). 3hdc (in red rows), 9sc (in cream, purple and green rows), 3hdc (in grey rows), 6dc (in green and red rows), 6hdc (in cream and purple rows), Hdc (in grey row). 2sc in corner and join to first st with a sl-st.
BR-2: Repeat BR-1, working in the b.l.o. and one st in each st, except 3sc in each corner st. I repeated the edge sts, adding one sc at each end (where the previous corners added a st). 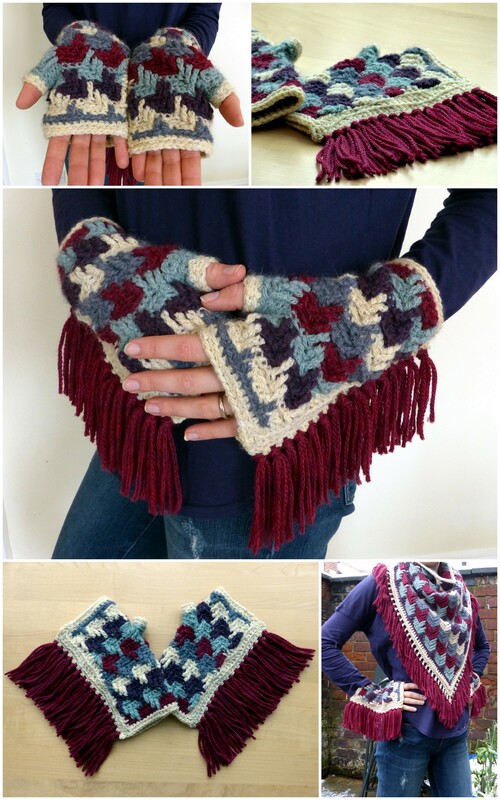 If you wish to block the gloves, do so now before making up and adding the fringe. I pinned mine to shape and sprayed with water to wet block. This was to avoid stretching the gloves out. Join the border colour through the top corners and sc the shaped edges together, working through the b.l.o of the front edge and the f.l.o of the back edge. Work from bottom edge to top edge on the right hand glove and from top edge to bottom edge on the left hand glove. If you are not adding the fringe, fasten off here. Otherwise, ch1, turn, sc in 1st st. Sk1st, ch1, sc, repeat from * along and fasten off. Weave in ends. Cut your fringe to the desired length by wrapping the yarn around a suitable piece of card and cutting down one edge. I used 3 strands per ch1 space made in the last row. Use a lark’s head knot to secure the fringe in each ch-sp, and trim as needed for an even finish. Wow, original model. thanks por the free pattern! Bicha from Buenos Aires, Argentina. WoW! Nice model, thanks for the free pattern. Vivian, from Buenos AIres, Argentina.